Knowledge of the technical relationships, e.g. in the Repository, ABAP Dictionary, program/class library and of the base programs and system interfaces forms the basis for the substantive analysis and documentation of BW data models. The prerequisite for developing our CT products is the considerable know-how and many years of experience (more than 30 years) of our development team. It is relatively time-consuming to get an overview of all objects used in a data model, to determine how these objects are interrelated, and to document this in a suitable way. Once the metadata used for a data model has been determined, a complex analysis and documentation of the relationships between the technical objects used should take place. A further problem is the lack of version management for technical objects (currently up to BW Release 7.3). As a result, it is currently not clear whether and when, for example, the aggregation logic or transformation within a BW data model has changed. It is at best difficult to determine the data context across a period of time. Using transactions in the standard application to determine the relationships between object types (e.g. InfoCubes and Queries) per BW model is also time-consuming because only single objects can be analyzed. A comprehensive documentation of all objects in a BW data model is not currently available within the standard application. 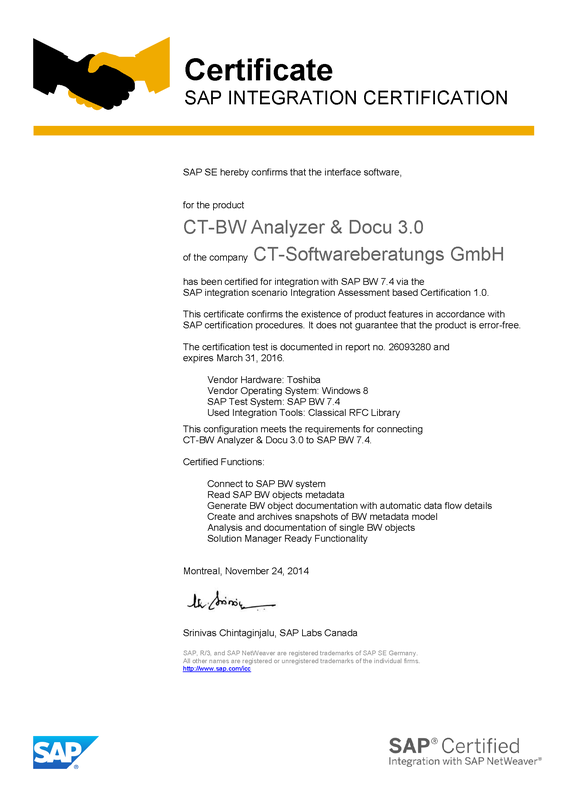 The SAP-certified add-on “CT-BW Analyzer&Docu” complements the SAP BW standard by providing new functions in the areas of “analysis and documentation”. The aim here is not to replace the SAP tools, but rather to extend them. If required, the new BW analysis functions can be automatically included in the BW documentation. In this way, extensive BW data models become easier to understand, and estimates and implementation of bug fixes and change requests are easier and take less time. The BW model to be documented is broken down into its separate parts in a clear way through the hierarchical analysis of InfoCubes, transformations, InfoSources, DataSources, data transfer processes, InfoPackages, and individual InfoObjects. Assigned SAP BW Queries are also analyzed and documented. You can record any important, manual comments on individual BW objects in specially provided documentation forms per BW object. You can use our (Microsoft Word®-compatible) CT-Editor for this. 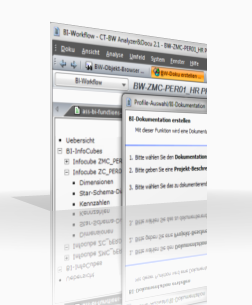 In addition, you can integrate external project documents (e.g. specifications, e-mails, diagrams, Microsoft Excel® sheets, explanations about loading processes, Query documentation) as attachments into the manual documentation at BW object level. Based on our SAP BW know-how, for purposes of simplification, we have developed documentation forms with checklists for about 20 BW object types. The checklists facilitate manual documentation, ensure that the information is complete, and make it possible to compare objects from different BW modules. The manual documentation is part of the full set of documentation that is generated. This full set of documentation for a BW data model represents the current status of the data model (at the time of the CT analysis) and is available in Microsoft Word®/HTML/HTML Help format. Clear, complete documentation of a BW data module can be created through automated analysis and structuring on the basis of the individual BW objects. If this full set of documentation is updated after each change to the BW data model, the result is a documentation archive of the BW metadata objects. Appropriate control and analysis functions at detail level in the SAP BW back end provide you with various views of the metadata of an SAP BW model. These formats are aimed at different target groups. For example, you can create Microsoft® Word documents for storage on the document server or linked HTML websites for displaying on the company intranet. The HTML Help format additionally offers you integrated full-text search. Thus, the results of an analysis are available as documentation in various formats (Microsoft Word®, HTML, HTML Help). You can search in them at any time using the full-text search. The CT-BW Analyzer&Docu module can be flexibly adapted to your company-specific analysis requirements and documentation guidelines. More than 150 document templates in Microsoft Word® format are available for you to adjust the analysis to meet your needs. In addition, the scope of the complete BW analysis/documentation can be adjusted with just a few mouse clicks using hierarchical document profiles. By choosing different document profiles, you can, for example, generate an extensive BW data model containing many technical details (for the IT department), or you can lay the focus on a more general graphical representation of the documentation results (for the business area). The analysis profiles (150 document templates …) provide you with further levels of detail within the full documentation set.. The screen shot below shows the Data Flow Assist, for example. 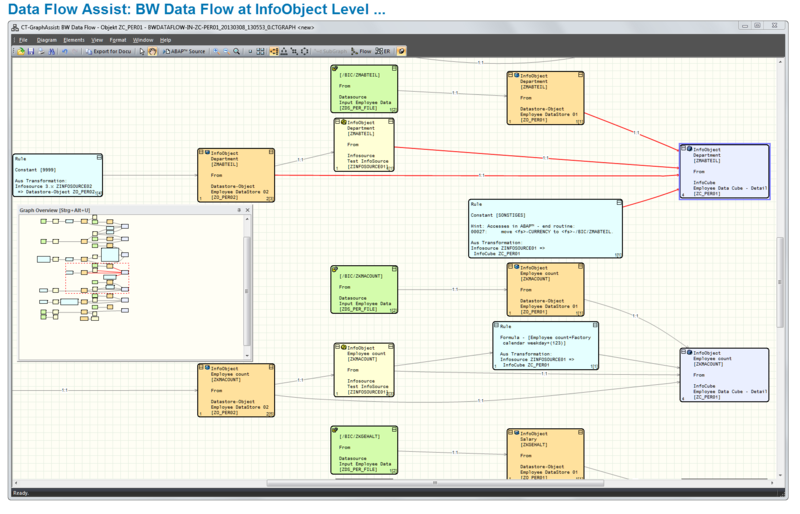 The Data Flow Assist shows in graphical form how the individual data fields have been updated. 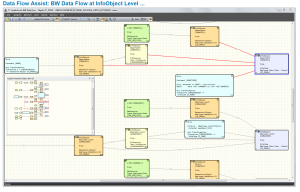 This new type of graphical data flow analysis on the basis of InfoObjects is not currently available in the SAP BW standard version. If you require manual comments for individual BW objects, you can write structured object documentation using the integrated ‘CT-DocuEditor’. To facilitate manual documentation tasks for important BW objects, we provide more than 20 documentation forms with checklists. We developed these checklists in the context of our consulting work. They facilitate manual documentation, ensure that information is complete, and allow you to compare objects from different BW models. The manual documentation is part of the full set of documentation that is generated. Knowledge of the technical relationships, e.g. in the Repository, ABAP Dictionary, program/class library and of the base programs and system interfaces forms the basis for the substantive analysis and documentation of BW data models. 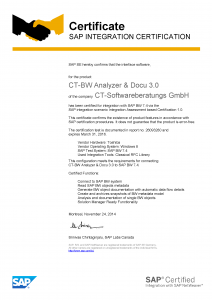 SAP SE certified ‘CT-BW Analyzer & Docu’ on 24-Nov-2014 and 09-Sept-2010.